Our research team recently came across some quack marketing claims on certain web sites. These sites claimed to have a method of getting all the results of needle electrolysis but by applying electricity through the skin without a needle. Misleading Advertising ExamplesExample 1Example 2Conclusion - Stay Clear! Needle electrolysis is the only form of permanent hair removal that's been backed up by scientific research. The procedure involves placing a needle into the Dermal Papilla and applying a small electrical current to denature the base of the follicle and prevent regrowth. Needle electrolysis is a very effective form of hair removal that involves applying an electrical current directly to the root of the hair follicle through a very thin hair-like needle. One of the key factors in the success of electrolysis hair removal is ensuring that the needle applies the current directly into the follicle. 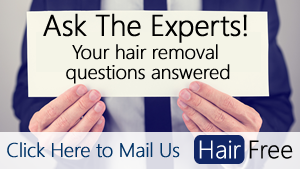 If the electrical current isn't applied correctly to the root of the hair, then electrolysis isn't very effective. Now onto transdermal electrolysis. Transdermal literally means "through the skin", so transdermal electrolysis means applying electrical current through the skin without the use of a needle. Hair is an incredibly bad conductor of electricity whereas skin conducts electricity well because it is 70% salt water. ﻿Given that electricity will always flow primarily through the path of least resistance﻿ then either no electrical current or a current that's greatly reduced will ever reach the hair follicle. Transdermal electrolysis would have to fly in the face of basic laws of physics in order to be effective. It would be massively lucrative to sell a scientifically proven device that was as effective as needle electrolysis but without all the side effects of an invasive treatment. ​Yet no studies have been published and no research effort is going into this sector. Despite a booming hair removal market, nobody is investing any money into transdermal electrolysis research because the results are already known - it doesn't work. We spent some time finding examples of misleading transdermal electrolysis advertising so you can see first hand what it looks like. All of these examples are currently published on various scam internet sites at the time of writing. This advert claims they have a "radically advanced procedure" and then it goes on to lie by saying that it has been clinically proven to be substantially equivalent to needle electrolysis. In actual fact there have been no clinical studies that have suggested anything like this. In fact, there have been no clinical studies at all. This article is from a beauty salon that offers transdermal electrolysis for its clients. While being less forthright about the effectiveness of the treatment the article does still allude to the possibility of permanent hair removal from this method. Advice: Don't consider signing up for any kind of hair removal service from a company that makes such misleading claims. Obviously, this is well and truly a scam that you should stay well clear of. ​To learn more about needle electrolysis that has been FDA approved for permanent hair removal then read this. Finally, spread the word. We already have ​a number of great people spreading the word about this, but if you have a marketing channel then be sure to warn consumers about this scam.